Do you wish to know the offers of available retail locations? Are you looking for new points of sale? Go to Codata Market Place. It's free and terribly efficient! 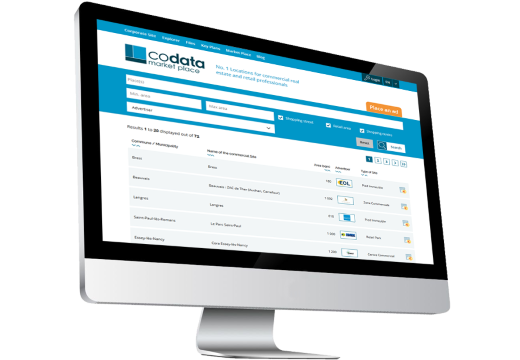 Codata Market Place is designed for professionals. Your browsing won't be disturbed by any advertisement. The search engine leads you straight to the point. No advertisement, no banner ads, no pop-up, no unwished link. You simply focus on your search. With Codata Market Place, find quickly the ads that interest you. Codata Market Place only displays offers posted by commercial real estate professionals. The ads are always of quality. Only Locations located in Codata perimeters! There are numerous visual media: maps, pictures, presentation leaflets, etc. Much information is imported from Codata Explorer: Key plans, Retail Location index card, picture, Site index card, Retailer index car, etc. Links towards customatised presentations of the advertiser are available: leaflets, videos, website, slideshow presentations, etc. On Codata Market Place, it's easy to consult ads. It's also very easy to advertise. And it's free. You can add as many links as you want: PDF files, pictures, videos, slideshow presentations, links to a website, etc. 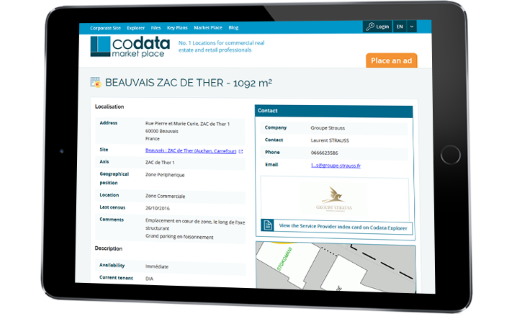 Codata Market Place is fast, simple and efficient to rent or sell your Retail Location. Your own area enables you to simply and quickly manage your ads. This area is secured by a login and a password. There, you can display the ongoing ads, delete them, modify them and add new ones. 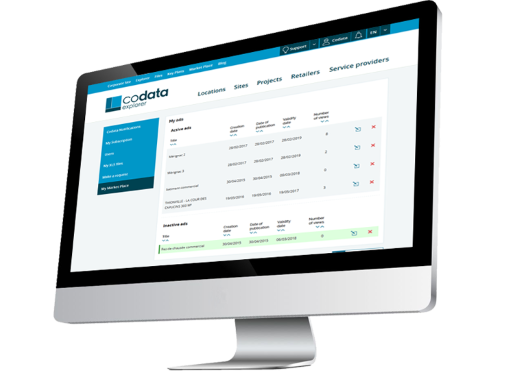 With Codata Market Place, it is a piece of cake to manage your ads. Your ads are not only displayed on Codata Market Place but also on Codata Explorer. They will even be integrated into Codata Explorer to make them more visible and relevant. 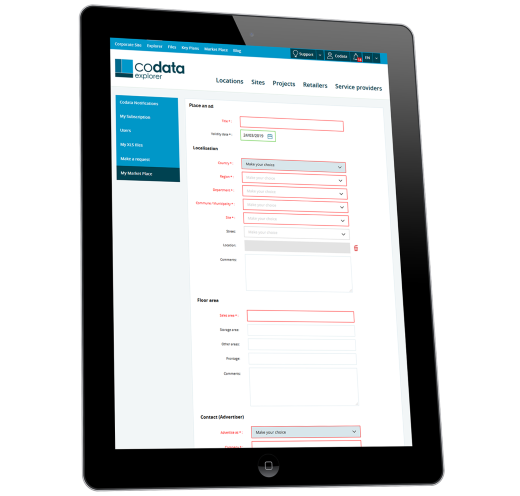 With Codata Market Place, enjoy a double visibility on Codata Market Place and on Codata Explorer. Increase your chances to quickly rent or sell your Retail Location. 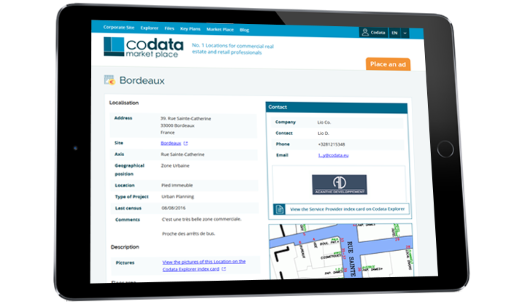 Codata Market Place is a Codata free service for the commercial real estate professionals.